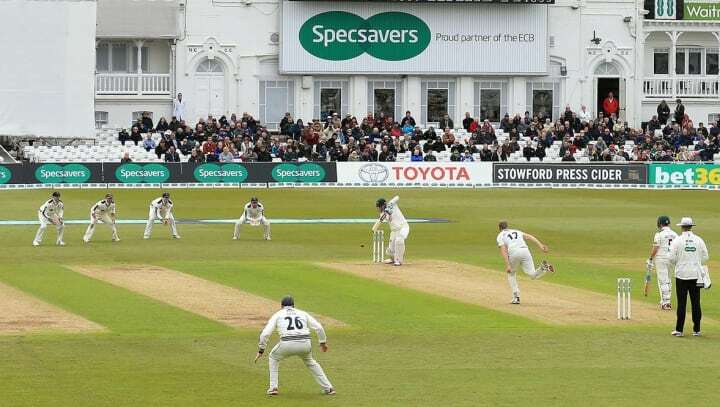 Nottinghamshire begin their programme of Specsavers County Championship fixtures with a home match against Yorkshire. The traditional rivals will meet at Trent Bridge between Friday 5 April and Monday 8 April, with play scheduled to begin at 11am each day. Nottinghamshire have hosted their northern neighbours on 131 occasions over the 156 years that they have been competing against each other. Between 1960 and 1991 thirteen of the meetings were played at the Town Ground in Worksop. Otherwise Trent Bridge has been the regular venue, where 22 home victories have been registered, 37 victories have gone to the away side and the remaining 59 clashes were drawn. Notts’ last three wins in the fixture came in 1993, 1995 and 2008. Yorkshire’s most recent successes were in 2010, 2013 and 2014, with the last three home meetings being drawn in 2015, 2016 and 2018. Nottinghamshire hosted Yorkshire at Trent Bridge between 4-7 September last year and gave home supporters a first glimpse of new signings Ben Slater and Ben Duckett. Slater, brought in from Derbyshire, had made his debut a week earlier, away against Surrey. Duckett, a former Northants batsman, was appearing for Notts for the first time. Both impressed as Notts made 448 after being invited to bat first by Tykes’ stand-in skipper Adam Lyth. Slater scored 109, the fourth first class hundred of his career, whilst Duckett blasted a quickfire 80 from 89 balls. Yorkshire responded with a sizeable first innings score of their own. Centuries from Tom Kohler-Cadmore and Gary Ballance led the Tykes to 498, with Samit Patel hogging the bowling honours for the hosts. The spinner sent down 47 overs and returned figures of six for 114. Notts were 93 for one in their second innings when time ran out. 1865 | James Shaw has the best figures by a Notts bowler at Trent Bridge against Yorkshire, taking eight for 32. 1901 | Nottinghamshire were dismissed for their lowest ever first class score here at Trent Bridge, as Yorkshire’s Wilfred Rhodes (6-4) and Schofield Haigh (4-8) whipped out their hosts for just 13. 1913 | A notable feat belongs to Nottinghamshire’s George Gunn, who scored a century in each innings in the 1913 encounter at Trent Bridge. 1929 | Percy Holmes holds the record for Yorkshire’s highest score at Trent Bridge, with an innings of 285. 1932 | Hedley Verity’s 10 for10 at Headingley are the best figures by anyone against Notts. Verity surpassed Wilfred Rhodes’ eight for 38 in 1899, the previous best by a Yorkshire bowler in Nottingham. 1988 | Barbadian all-rounder Franklyn Stephenson enjoyed a once-in-a-lifetime performance in the 1988 clash in Nottingham. Before his achievements that week, only another Nottinghamshire player, Richard Hadlee in 1984, had achieved the modern ‘double’ of 1000 runs and 100 wickets in a first-class season since the number of games was reduced in 1969. ‘Franky’ went into the final game of his debut season at home to Yorkshire still well short on the number of runs, although he reached the 100 wicket landmark a couple of weeks earlier. Incredibly, having not made a century all season, he rattled off scores of 111 and 117 and celebrated by also taking eleven wickets in the match. Staggeringly, Notts somehow contrived to lose the contest. 1990 | Tim Robinson scored an unbeaten 220, the highest by a home batsman at Trent Bridge v Yorkshire. Close links between the two counties have been inevitable over the years and many players have represented both in championship cricket. Amongst the players to have represented both counties are; Greg Blewett, Brian Bolus, Mike Bore, Kraigg Brathwaite, Mark Broadhurst, Gareth Clough, Phil Jaques, Gary Keedy, Younis Khan, Michael Lumb, Ashley Metcalfe, Cheteshwar Pujara, Ajmal Shahzad, Ryan Sidebottom, Barry Stead, Richard Stemp and Alex Wharf. Hat-tricks | Yorkshire (7): H Verity (Headingley 1932), FS Trueman (Trent Bridge 1951), FS Trueman (Scarborough 1955), D Wilson (Middlesbrough 1959), FS Trueman (Bradford 1963), D Wilson (Worksop 1966), AL Robinson (Worksop 1974). Former Yorkshire fast bowler Fred Trueman is the only man to take three first class hat-tricks against Nottinghamshire. The England international achieved the feat at Trent Bridge in 1951, at Scarborough in 1955 and at Bradford in 1963. Chris Nash (11,833) is nearing 12,000 first class runs. Stuart Broad (4,925) is approaching 5,000 first class runs. Joe Clarke (3,965) needs 35 more first class runs to reach 4,000. Steven Mullaney has taken 96 first class wickets, 95 of them for Notts. Tickets are available in advance online, by visiting the Ticket Office in person or by calling 0115 899 0300. You can also purchase tickets on the day from the Ticket Office window counters on Bridgford Road, adjacent to the Hound Road turning. For more information please see our matchday guide. If you can’t make it to the ground, we offer the perfect matchday companion. You can also find regular live updates on Twitter and Instagram.